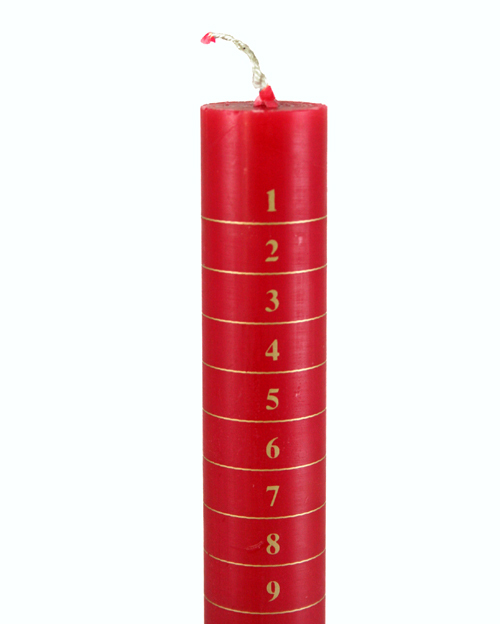 Count down to advent with elegance using this Candle that is perfectly placed from Church Services to Dinner Tables. Want to refocus on Christ this Christmas? 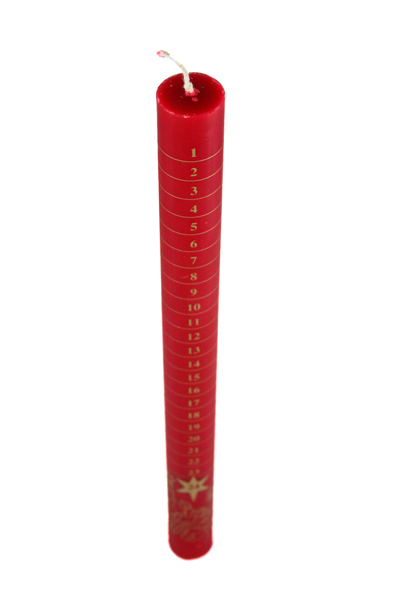 Candle size: 12" x 7/8"
Make a new focus for your Advent thoughts and prayers with a day-marked Advent candle. Easily find a place in your home for this space saving alternative to Advent crowns and candles. Mark the days to Christmas with its daily lighting. Focus your thoughts and prayers on the birth of Jesus and on his return as Christ the saviour king. Light the candle for your personal devotions throughout Advent or as the centrepiece of family meals or prayers. Let the stillness of its warming glow provide an opening for you to tell the Christmas story to the children. Gold calendar lettering, The Christmas star and a delightful nativity scene reveal your Advent candle?s origins in the fine 160 year tradition of Charles Farris, maker of English church candles by Royal appointment. To relight, ensure the wax pool is clear of debris. Don?t move the wick from its old shape. Extinguish the candle with a snuffer. Don?t damage the wick or the lip of the wax pool. Keep at least 2' (60 centimetres) of head-space above the flame and any surface or material. This candle is block red rather than dipped. 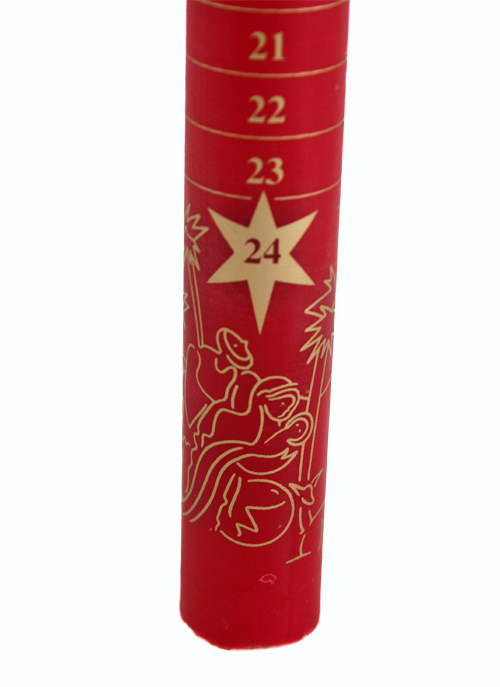 Red Advent Candle Printed with Gold (Each) is published by Charles Farris and is our 8446th best seller. 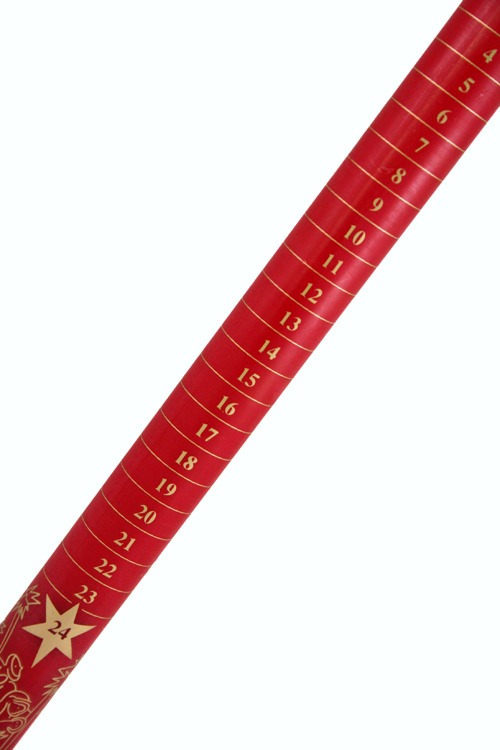 The ISBN for Red Advent Candle Printed with Gold (Each) is AC-NMR. These have been popular items for individuals and families to celebrate Advent which I have sold on the church bookstall for several years, with many compliments and no complaints. They are excellent value and of good quality. In the picture the gold on the candle looks bright and stands out. In reality the gold marking is very dull and difficult to see. I have had red candles in the past where the gold writing stood out very clearly so I know it is not the colour. I don't usually give bad reviews but I am very disappointed with the candle and if we had not had such trouble receiving it (2 failed attempts to send it) I would be sending it back. I don't know how it burns as it is not advent yet. The candle is good quality but the advent countdown printing is barely visible and incredibly hard to read. At first glance I thought it was a plain candle. The item was sent quickly, carefully packaged and was as described. I regularly buy Advent candles from you every year. I bought 4 this year, and send three of them out to friends. We light ours every evening at the table while we have our evening meal, and it is a tradition we have kept for the last thirty years. Eden are the best value, and always good quality. Got a question? No problem! Just click here to ask us about Red Advent Candle Printed with Gold (Each). What is the diameter of the candle please? A:This candle's diameter is 7/8", or 22mm. Thank you for using the Q&A Forum. Hello please could you tell me the right size candle holder which would fit this candle, thank you! A:My usual inclination is to play it safe and get a larger holder, rather than smaller, so I would recommend this one (https://www.eden.co.uk/shop/large-gold-candle-holder-4368046.html). Thank you for using the Q&A Forum.